Welcome to Sail Grand Waterfront. 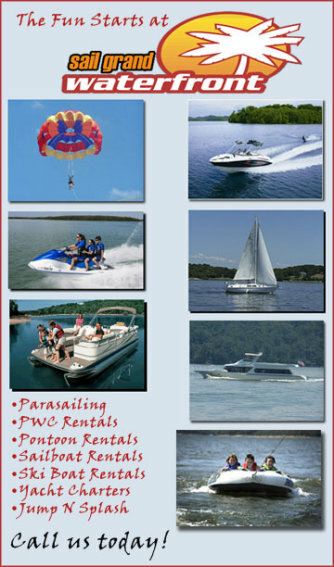 We offer a world of excitement on the water including a variety of watercraft rentals and parasailing adventures. Whether you are here for a few hours or a few weeks, we hope to help you have a great time on Grand Lake. When you make a reservation, we will take a deposit of 50% of the rental. Visa, MasterCard, and Discover are accepted. In order to rent any form of watercraft, you must have a valid credit card and ID for the damage deposit. We do not run anything on the damage deposit unless something is damaged. Our dock person will check the craft with you before departing and will check it back in upon return. Our rental rules are based off of the GRDA regulations. You may cancel with at least 72 hours notice before your scheduled reservation. If it is past the cancellation period, there is a fee of 50% of the rental rate. Our Bluewater yachts are perfect for corporate team building, class reunions, anniversaries, customer appreciation, or parties of any kind. Our experienced captain and crew are available for two hour to all day excursions or romantic sunset cruises, whatever fits your party needs best. You can add parasailing and seadoos for an amazing watersports experience. Charter rates start at $900.00 and vary according to the number of guests. Cruise the shore line north to Sailboat Bridge or south past Governor's Island from 8:00 to 10:00. Bring your choice of food and drink or have us set that up for you. Enjoy one of the beautiful sunsets on Grand Lake O' the Cherokees. Short cruise to Woodward Hollow, then anchor to swim for 2 to 3 hours. Bring your lunch for a fun relaxing afternoon. Add more by adding Sea-Doos for an additional charge. For the perfect combination of relaxation and excitement, choose our watersports package. Relax and enjoy family and/or friends with a 4 hour cruise in the comfort of a Bluewater yacht. Our parasail crew will come to the yacht for those who want to raise their heartbeats with a 500 ft. flight over Grand Lake. (up to 10 parasails included) Others may choose to speed up the pace or explore the area by riding the 2 Sea-Doos included with this package. * ALL CRUISES CAN BE CUSTOMIZED TO FIT YOUR NEEDS. Our experienced captain and crew will show you a bird's eye view of Grand Lake. The 500 ft. Ride in the air is fun and exciting for all ages. You will take off and land in the boat. Up to 6 fliers per trip. Single and tandem rides available. Parasailing is offered THURSDAY-SUNDAY! Call for reservations and weight restrictions.